Special note: For every user added to your Cloud during the month of January, Cloud9 Real Time will make a donation to the “Plant a Billion Trees” initiative from the Nature Conservancy. Also, ‘green’ is associated with revenue, profit, money, ‘greenbacks’ and all, so ‘green’ cloud computing is also used to describe the vast economies of scale, rapid market adoption velocity, and amazing business efficiencies and potential revenue growth of cloud computing initiatives. Carbon footprints and climate change top the planet’s list of worries, largely due to our reliance on ‘dirty’ energy from fossil fuels. Often we blame the industrial sectors as the culprits of pollution and atmospheric stress, but it’s actually the IT industries that should rightly be shouldering the blame. Governments increasingly place demanding limits on factory and industrial energy consumption and emissions while such power consumption and pollution from IT and computer processing and data centers is often largely ignored. Research warrants that much energy is being squandered as IT needs are universally converted from AC to DC, and made even worse because it costs twice as much to cool a server than to power it. We know that plastic is hazardous to the environment, but e-waste is more damaging than plastic. Additionally, the development and production of digital componentry requires various highly toxic materials, including arsenic, antimony, lead, cadmium, beryllium and worse – shown to cause long-term harm to the environment. This is where Cloud tech and office virtualization shine a bright green. 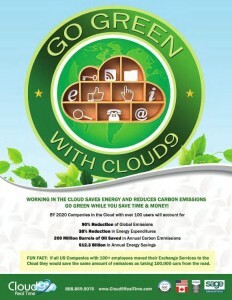 Green cloud computing stunningly leverages existing resources to an extent not thought possible only a decade ago. A 2011 study from the not-for-profit Carbon Disclosure Project, for instance, posits that green cloud computing solutions could help large U.S. businesses save $12.3 billion for American businesses and generate 86 million fewer metric tons of carbon dioxide annually by 2020. Analyst firm Pike Research, for its part, predicts that green cloud and IT solutions will produce a 31 percent drop in global electricity consumption by 2020. Conserving Energy: When your business uses green cloud computing to save its data in a multi-tenant data center environment, you save energy through resource pooling, doing away with overheated server closets, increasing the life of your desk station PCs, cutting IT service and maintenance costs, and reducing your environmental/CO2 footprint. Telecommuting: Green cloud computing provides the capability to work from anywhere at any time on any mobile device or computer, employees have the option to work from home. Cutting out the fuel emissions from daily commuting contributes to the global green movement. If a daily telecommuting model works for your organization, you can also cut both costs and energy use on office space real estate. Paperless: With the flexibility of green cloud computing, your company has the option to securely store all of its data on the Cloud eliminating the need to purchase paper products and file hardcopy, printed records. Remember us, Cloud9 Real Time. Our custom cloud solutions for business, nonprofits and professional practices garnered more industry awards last year than most of our competitors combined. Ready for a test drive?